Money for public schools, the University of Alaska and scholarships got chopped Wednesday when Gov. Bill Walker took his veto pen to the Legislature's state budget. Away went $10 million from the university's budget. So did about $6.4 million from the per-student funding formula for school districts, $6.4 million from student transportation, $4.7 million in one-time funding for public schools and more than $40 million for construction projects. In total, more than $150 million once set aside for schools, the university and the state education department disappeared. "Cutting the funding to all levels of our education system, from pre-K to our UA system, is cutting Alaska's future before it even gets a chance to grow," said Juan San Miguel, Alaska PTA president, in a Wednesday statement. For the first time in more than two decades, money got slashed for school debt reimbursement, the state's major school construction program that pays 60 percent of some bond debt and 70 percent of others. The Alaska Legislature passed a five-year moratorium on reimbursing any new school bonds approved by voters after Jan. 1, 2015, but the state continued to help pay for bonds passed before that date. Walker's cut eliminates 25 percent of the pool of money to pay off those bonds that were previously approved. That means communities will have to find the money to pay off the bonds for the next fiscal year, which starts July 1. The cut totals $30.5 million. For Anchorage, that means the loss of more $11 million, according to Heidi Embley, Anchorage School District spokesperson. It remained unknown Wednesday how Anchorage would make up for the lack of cash. "We are still looking into the effects on the municipality, but we are concerned about the impacts to Anchorage taxpayers," Nora Morse, city spokeswoman, said in an email. "This will shift the financing to Anchorage residents due to the Legislature's inability to come up with a fiscal plan." Walker also cut $10.4 million from the rural school construction budget, reserved to pay for projects at schools without tax bases. The University of Alaska lost nearly $19 million in state funding to pay for a controversial, north-south road through Anchorage's University-Medical District that would have linked Elmore Road and south Bragaw Street. State lawmakers had transferred the money to the university this year after Anchorage Mayor Ethan Berkowitz pulled the city's support of the road project. Walker eliminated $10 million from the University of Alaska's system budget. The Legislature had included about $335 million in state funding for the university system, and that's the number UA crafted its budget around, which its regents passed in early June. A prepared statement from the university said $8.5 million would be cut across areas that were set to receive a "modest increase," including research, workforce development, the Alaska Native Science and Engineering Program, "initiatives focused on development, degree completion and student recruitment/retention," and Title IX compliance, the federal law that guarantees gender equity in education. 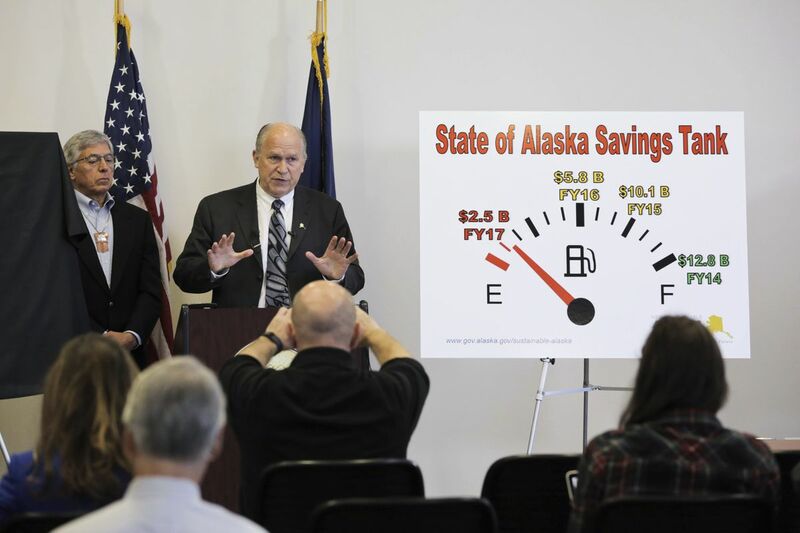 Walker's vetoes cut $80 million from a $410 million deposit into the state's Higher Education Investment Fund, established by the Legislature in 2012 for long-term funding for Alaska Performance Scholarships and the Alaska Education Grant program. The cut will not affect scholarships in the upcoming fiscal year, according to Stephanie Butler, interim executive director of the Alaska Commission on Postsecondary Education. The fund is invested and grows with donations and appropriations, she said. About $6.4 million was cut from both the per-pupil funding formula and transportation funding for public schools, plus $4.7 million in one-time funds. Together, those three budget items account for roughly a 1.4 percent reduction in funding. The net loss to the Anchorage School District, taking into consideration money from the Legislature not yet budgeted, is about $4 million. Deena Paramo, the school district's new superintendent, said in a statement the district was working through contingency plans. "We understand there will be adjustments statewide as we move forward and address Alaska's revenue crisis, however we are disappointed that K-12 funding was cut in the 11th hour," she said.